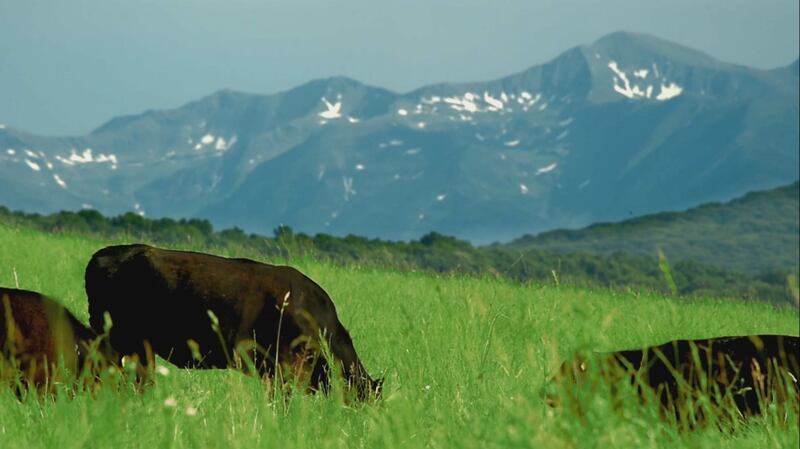 The key to producing premium beef lies in rearing healthy animals that live in nature on healthy grasslands. Our Angus beef cattle have access to fresh, green grass and clean water, being on pasture all year round. This natural method of rearing, along suckler cow husbandry, makes for most of the growth cycle and is optimal both for animal health and the environment. Our cattle are reared antibiotic-, hormone- and steroid-free. The BioPark farm in Nocrich represents the central unit for Angus cattle rearing, as on its pastures there are about 3000 head of Angus cattle. All our cattle are of certified origin, carefully selected and improved every year by experts in Angus husbandry, both on our own farm and by our partners abroad. Each animal on the farm is registered in our Stockbook management system, which includes information about it from details of calving, weight, breeding, bodily growth, tests, vaccinations, maternal traits, up to genetic transmission of value. In this way, with the assistance of Aberdeen Angus Association Romania as well as of the Breedplan growth and improvement system, only the most valuable bovine animals meeting all breeding standards are kept on the breeding farm. We use the latest rearing methods, like the GENE-MARKER tests, to ensure beef quality, tenderness and marbling, and feed conversion. This also involves security assurance at all production stages, traceability for each animal, DNA testing – from steak to live animal. Suckler cow husbandry allows us and our partner quality control, which guarantees the high standard of our beef. Karpaten Meat wants a durable partnership with partner farms. To this end, we establish a calves production relationship that is as efficient as possible, aiming for outstanding results both for our partners and our customers. The herd management used on our breeding farm follows years of work on Angus farms, streamlining processes, infrastructure and feeding, focusing on effectiveness and cattle husbandry at high health and safety standards. The Angus breed cattle husbandry system is extensive suckler cow husbandry on grasslands, meaning that the calf stays with its mother until turning 8 – 10 months old, when it is weaned. Meanwhile, calves are on pasture and are only fed cow milk and pasture grass, with no extra food supplements. This breed has a high feed efficiency of pasture grass, even when the grass is of modest quality. Even during winter the cattle are grazing and not gathered in. Angus breeding cattle must not be kept in indoor housing because they could be affected by temperature differences. Most of the breeding cattle stay outdoors all year round, being fed hay and grass silage during winter.